This post was originally published on September 9, 2010. It was substantially revised and re-posted on October 27, 2014. It’s an ancient name worn by a twentieth century supermodel and a famous girl vampire, too. 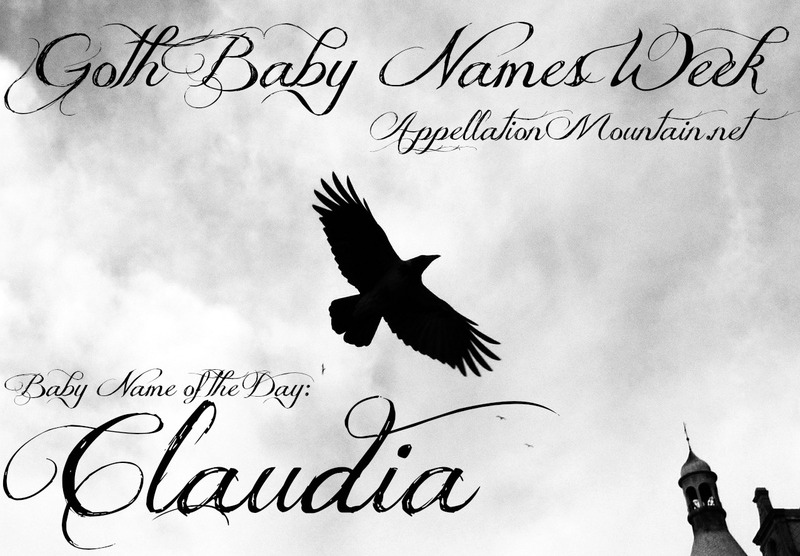 Goth Week begins with Claudia as our Baby Name of the Day. Ancient names are in favor, and ends-with-ia choices have fared well for girls in recent years. But despite the interest in Atticus and Olivia, Claudia remains rare. Claudia is simply the feminine form of Roman family name Claudius. The first emperor Claudius is more especially famous, thanks to Robert Graves’ historical novels, I, Claudius and Claudius the God. First published in the 1930s, they remain widely read today. The BBC adapted them for television in the 1970s. Claudius was frail as a child, and stammered as an adult. It isn’t clear what ailed him – polio, maybe, or cerebral palsy. Rather than a soldier, he became a scholar – and so was never seen as a threat by his scheming and ambitious relatives. He survived the reign of his nephew Caligula, and at the age of forty-nine, found himself named the fourth Emperor of Rome. In Latin, claudus means lame. The fact that the most famous bearer suffered from a mysterious affliction reinforces the meaning. And yet, Claudia was common. The name is mentioned briefly in the New Testament, and by custom is considered the given name of Pontius Pilate’s wife. Mrs. Pilate is considered a saint in the Eastern Orthodox Church. Legend has is that another Claudia was born a British princess and brought to Rome as a prisoner. Her son, Linus, became the second pope, and she is considered a saint in the Roman Catholic Church. First Lady Claudia Alta Johnson – better known as Lady Bird. The first woman three-star General in the US Army, Claudia Kennedy. Television characters on Dynasty, Party of Five, and 24, as well as The West Wing’s CJ Cregg – born Claudia Jean. A member of The Babysitter’s Club also wore the name. Claudia headlines Goth week thanks to Anne Rice’s doomed vampire child, played by a very scary Kirsten Dunst in the movie version of Interview with the Vampire. Dunst was twelve, though the character of Claudia was just five when she became a vampire. Lethal, chilling Claudia figures in several more books in Rice’s vampire series. And yet that’s probably not most people’s first association with the name. German-born supermodel Claudia Schiffer comes to mind, lending the name some glamour. Plenty of other feminine forms of Claud- have seen some use: Claudette, as in Hollywood actress Claudette Colbert. And then there’s Claudine – or Monster High’s Clawdeen Wolf. The claw- sound might be off-putting. In other languages, the name sounds more like CLOUD yeh or cloud EE yeh. Claudia is a perpetual member of the US Top 1000. But at #661 in 2013, the name has fallen quite a bit, and is at a low point. That could make for a great opportunity. With her stylish -ia ending and ancient ties, Claudia will fit right in with favorites like Sophia, as well as stylish up-and-comers like Sylvia and Aurelia. And yet, since she’s relatively rare, Claudia will remain a stand-out choice for a daughter. What do you think of Claudia? How would she wear in 2014? Or is her ‘claw’ sound too off-putting? I fell in love with the name Claudia after reading Anne Rice’s book. I named my daughter Claudia because I loved the name but also because it is uncommon but not odd. My daughter is now 20 and she has always loved her name. She likes telling people she was named after a vampire. Don’t forget that Claude is another variation of the name used for girls in France, very unusual in English and has been the name of two French Queens. My names Claudia and I go by Cee-Cee (from like Cici) as my last name also starts with C and there were two other Claudia’s in my class (it was a top 100 name at the time in Australia) and another Claudia C. I also know a few other Claudia’s. But Cee-cee was how my older sister said my name since she couldn’t say Claudia and it came out as Cee-Cee, I have gone almost exclusively by it and have had people assume I’m names Cecilia since I often were jackets with Cee-Cee on them (leavers). I do love my name but the meaning is a turn off since my first and middle name mean lame and white (Claudia Bianca) and another Claudia’s I know is lame and bitter (Claudia Mary), it needs to be paired with something with a positive meaning. I like Claudia a lot. It doesn’t feel forced or pretentious to me. It’s got the same international feel as Sophia and Lucia minus the popularity. But I always think of it with Cecilia (“blind”) and I love Cecilia just a little bit more. I also think some of Chloe’s popularity and Claire’s steadfastness makes Claudia feel like a sound I hear relatively often – even though I meet hardly any little girls named Claudia. It’s not too vampire-y for me… but I love a lot of ‘witchy’ names. Something about swirling and dark doesn’t put me off at all – Morwenna, Ravenna, Keziah, Tabitha, Ursula… and Claudia fits pretty well. I wonder if CiCi or DiDi would be acceptable nicknames. Claudia in its entirety seems heavy on a tiny child. It reminds me of Cornelia in that respect. I like it! Familiar yet seldom heard is the perfect way to describe this name. I love that people recognize it, but it isn’t overly used. My name is Claudia too, and I didn’t realize that it was so popular or maybe so great name for people! I really got happy, because I don’t know any human named Claudia. The only thing bothering me is, Claudia hasn’t got any nickname and I don’t like Claude or Cloudy. People in school call me Dudi! wow, didn’t know all of this stuff about my name, its pretty cool though. I, myself was named after my great-grandfather, Claude, and his fathers name was Claudie. But i am shocked at how many people like the name. i never have really been to fond of it. i have considered changing it, but there is so much to learn about it. I am really considering Claudia for a girl, it’s a family name for us….my great aunt was a Claudia who went by Audi. Lola is a good nickname ( in response to the first comment) but I love this name. I makes me think of the X-files for some reason. I first heard of it in the Baby Sitter’s Club books — Claudia was my favorite character. Now the name is on our list for a daughter. Love it. When I was younger the combo Claudia Monet was on my list [since I love the way it sounds and Claude Monet is my favorite painter]. It’s dorkily fantastic. If we had a Claudia, I’d probably end up calling her Monet or MoMo or NayNay as nicknames. I grew up watching The Chipmunk Adventure movie. It’s bad guys are a brother and sister duo named Klaus and Claudia Furschtien. When I here the name “Claudia”, it’s in Klaus’ exaggerated [German? Austrian?] accent. So basically, it has a comical edge. Plus, I’m too-familiar with it’s meaning to ever consider it. *Its, not it’s (both times!). Also hear, not here. Wow, I was on a roll today. I like Claudia. I’m also fond of Claudette and Claudine. Ah, Claudette! As in Claudette Colbert, as in It Happened One Night – great name, and one of my favorite movies of all time. I have a friend who started out life as Phoebe and re-invented herself as Claudia. I understand that she had quite the reputation in high school and wanted a new name that would seem mature and serious. I’ve always thought it sounded nice. As a child who grew up in the 80s and read The Baby-sitters Club books, I suppose it would appeal to me. Doesn’t appeal to me at all…even Ladybird and CJ Cregg went by nicknames. It seems overly patrician to me, like the parents are willing their child to be on a co-op board someday or chair a library guild. It might wear better among Ivy League tots than here in Texas. In fact, most Claudias in Texas are probably Latinas (of any and all backgrounds). Claudia is certainly appealing. Love the sound. But I cannot get over the meaning. Claudia was the name of the day back in ’08! Claudia doesn’t do much for me. I don’t like her sound, and the meaning doesn’t do much for me. Claudie is cute as nickname. I also like Claudine. And if I were to use Claudia I would pronounce it CLOUD-yeh. It sounds so much softer and lighter. Ack! Can I be running out of names? Thanks, Eva! I’ve always been drawn to Claudia. She features as one of the four friends in the popular YA “The Babysitters Club” series. And I absolutely love the way it’s said in other countries – cloud is a prettier sound than clod (or maybe it’s just a nicer association in English). The lack of obvious nns is a bummer… stretches I’d go for are Clio, Clia, Lia, and Dia. Claude is OK, but because it sounds just like clod in my accent (and clawed in some others) it’s not all that appealing to me. The meaning is a “so what” for me… it’s just not a strong enough negative for me. As for apotropaic names… I would venture that maybe some of those Crystals out there were named, at least in part, for the mystical properties of crystals. Also, I wonder about the names like Phoenix… I’m specifically thinking of Spice Girl Mel B’s child Phoenix Chi… with a mythical bird that rises after dying and an energy flow meaning mn, it makes me think there was some kind of “keep away bad, bring on good” meaning intended. JNE, that’s a very good point about Crystal – I hadn’t considered it, but I’m sure you’re right. I know a 10 y.o. Claudia – I believe she’s named after a family friend. I guess Claude and Claudie are options, but Claudia IS one of those names where you have to be willing to go nickname-free. what about Lottie as a nickname? I think the nickname-free aspect of Claudia could be a plus for some people. […] in the Top 1000 included Homer, Virgil, Julius, Cassius, and Lucius for boys and Minerva, Cornelia, Claudia, Aurelia, and Valeria, for girls. 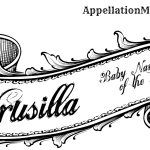 […] – Supermodel mama Claudia Schiffer and director Sofia Coppola both gave this name to daughters born in May of 2010.